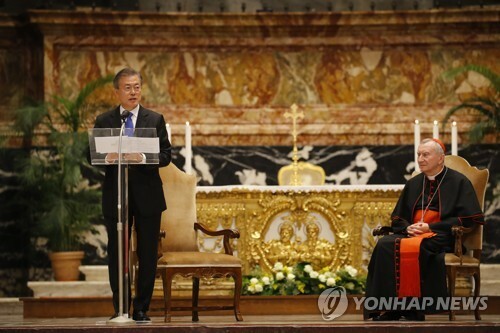 VATICAN, Oct. 17 (Yonhap) — President Moon Jae-in summoned the Christian love for humanity and the European spirit of unity to inspire peace on the divided Korean Peninsula Wednesday, as the South Korean leader preached his policy to engage and denuclearize the rival North at the Vatican. Moon attended a rare special mass for Korean peace at the Basilica of St. Peter, presided over by Cardinal State Secretary Pietro Parolin. “The love for humanity that bloomed in Christianity and the European civilization has traveled through time and space to give hope to the Korean Peninsula. The spirit of inclusion and alliance that the European Union has been working to realize is giving inspirations in our journey toward lasting peace on the Korean Peninsula,” he said in an address after the mass. Moon plans to meet with Pope Francis on Thursday and will deliver an invitation from North Korean leader Kim Jong-un for the pope to visit Pyongyang, according to the presidential office. “The prayer for peace on the Korean Peninsula that resounded at St. Peter’s Basilica today will echo in the hearts of the people in South Korea, North Korea and all the rest of the world who hope for peace,” Moon said. Moon said amazing changes were already happening on the peninsula. “In September, I and North Korean Chairman Kim Jong-un adopted the Pyongyang Joint Declaration. We agreed to end the military confrontation between the South and the North, and declared before the world in which we will build a Korean Peninsula free of nuclear weapons or nuclear threats, a peninsula of peace,” he told the mass. Moon stressed the two sides are faithfully keeping the promises by withdrawing weapons and guard posts and removing land mines from the heavily fortified border area. “The United States too has sat down face to face with North Korea to end their 70 years of hostility. As the pope prayed before the North Korea-U.S. summit, we are ‘developing a positive path that assures a future of peace for the Korean Peninsula and the whole world,’” he added. “It will be a great help to my people who wish for peace. Our prayers today will come true in reality for certain. We will surely overcome our division,” he said. Moon is currently on a five-nation European tour that earlier took him to Paris. In his summit with French President Emmanuel Macron on Monday, he called for the world to begin extending its support for the impoverished North, at least to further motivate the country to give up its nuclear weapons. “We must further encourage North Korea’s denuclearization process by easing U.N. sanctions when and if we decide the North’s denuclearization process has at least reached a point of no return,” he was quoted as saying during the summit.